In this story a woman Is tied to the FBI. But she is not an agent. 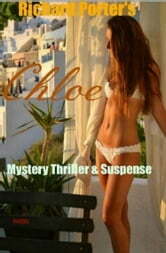 She ends up doing a lot of clandestine work for the FBI. Not only does she do the work. She runs into the mob and takes them head on. No she&apos;s not the Battery bunny. But she keeps on ticking. This is a suspense filled book. I have created,a woman character named Chloe. She is not only beautiful but intelligent, strong,loving and faithful. On the other hand. You will love this type of women, and we see them in everyday life. You should read every page. Then present this book to your best friend. They will read this story and feel good about themselves. If I could put a copy in every single young adult&apos;s hand. I would do so, that being said. You&apos;ll have an opportunity today to find out what my little story is all about. As mentioned above, Chloe will have you laughing, she will have you thinking she&apos;ll have you crying right along with her and in the end.You&apos;ll want to hug her for the wonderful job that she&apos;s has done.